West Virginia is also known as the Mountain State. The Appalachian mountains roll through here, some of the most decisive Civil War battles were here, and the Shenandoah carves its way through this state. Historically, the lumber and coal mining in West Virginia was imperative to the progression of the United States. Logging is still a major industry here, but coal has been slowly shrinking as other energy sources are developed around the country. The tourism in this state is quite active, especially for outdoor activities such as whitewater rafting, hiking, hunting, fishing, and rock climbing. If you’re into history and outdoor life, then West Virginia is a great state for you. Check our rankings below for what cities are safest, so you can fully enjoy the scenery and activities this state has to offer. Several of the 25 safest cities in the state have seen a decline in property crimes, and a few have seen declines in their violent crime rates. Most notable is Lewisburg, with a 81.7% decline in violent crimes. Overall, the state has fewer cities with high safety scores compared to other states. This is due to some areas having high unemployment as energy sources change from coal to other, more environmentally friendly ways. With such a change to the way of life of so many people, many may turn to drugs, and therefore their propensity for crime goes up. It's the same as any other place though, the unsafe places are concentrated to specific areas. Our guide will help you navigate to the safest areas. The safest city is Weston, with an impressively high safety score of 99.34. This is a city that is very proud of it’s history, and therefore a very tight community. This is the type of town where everyone knows everyone, and that sort of close knit relations helps deter any propensity for crime. Elsewhere in West Virginia is Charles Town (92.60), known for its horse races, and Grafton (96.63). The safest cities tend to be towards the east, closer to Maryland. 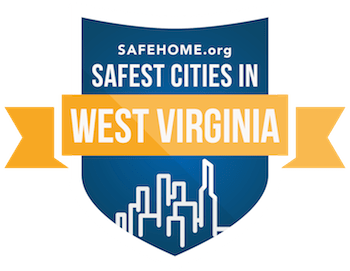 Further south is Beckley (37.91), which is the lowest ranking city out of our top 25 safest city.